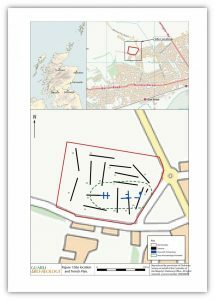 Between 17th and 19th August 2016, a small GUARD Archaeology team led by Maureen Kilpatrick carried out an archaeological evaluation of ground off Balmachie Road, Carnoustie. This work was undertaken on behalf of Angus Council to address a planning condition related to the development of the land into two football pitches. Archaeological evaluations are often required for planning developments where there is a potential for unknown archaeology to be encountered and which would otherwise be destroyed by proposed development. Though there were no known archaeological remains within the development area, the Aberdeenshire Council Archaeology Service (archaeological advisers to Angus Council) considered there was a potential for unknown archaeology given that Neolithic and Bronze Age pits had been encountered nearby. The main aim of the archaeological evaluation was therefore to establish the presence or absence of previously unknown archaeological deposits. The trial trench evaluation investigated a 5% sample (1,415 m²) of the proposed development area of 2.83 hectares. A total of 15 trenches were excavated by machine excavator under the watchful eyes of the GUARD Archaeologists, with a further 162 m² excavated when archaeological features containing sherds of prehistoric pottery were uncovered. During the evaluation, and subsequent expansion, 19 features of archaeological significance were uncovered, predominantly comprising pits and post-holes, all concentrated within the south-eastern area of the site. This entry was posted in Blog on August 22, 2016 by Author.